The classic card game Hearts for iPhone, iPod Touch, and iPad. Compatible with all hardware devices that run Apple’s iOS version 3.0 or later. View Hearts Net iPhone3 screenshots, Hearts Net iPhone4 screenshots, Hearts Net iPad screenshots, Hearts Solo iPhone screenshots. Hearts Solo is free. Try it to see if the game is for you. Hearts Net costs a few bucks, and allows you to play against your friends via WiFi, Bluetooth, and Game Center. Should I get Hearts Solo or Hearts Net? If you’re new to the game, by all means, start with Hearts Solo. It’s a free, no-risk way to find out if it appeals to you. 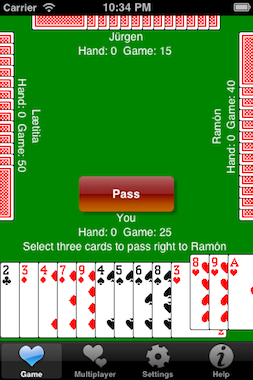 It has all the features of Hearts Net, except that it does not allow you to play against other humans, and it will often force you to quit in the middle of a game. Sorry about that, but Hearts Solo exists only for you to evaluate the game. If you’ve been playing Hearts Solo for awhile and you like it, then it’s time to upgrade to Hearts Net. 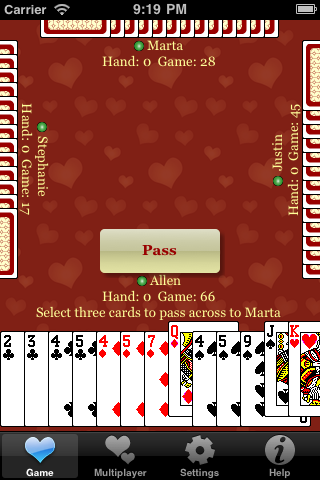 It has all the features of Hearts Solo, and it also allows you to play Hearts against your friends, no matter where they may be, so long as they have an internet connection. One unique feature of Hearts Net is that multiplayer games are very robust. Say you get a phone call in the middle of a game, which forces Hearts Net to shut down. 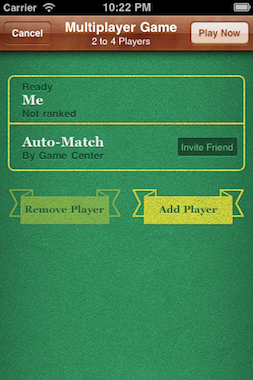 The other players in the game will notice that your status has changed. If they choose to wait, then you can go back into Hearts Net after your call is over and the game will be resumed. Multiplayer games via Game Center feature voice chat. Talk to your opponents, keep your hands free for the cards. • I think the game’s new themes are pretty, but apparently not everybody agrees with me. So I added a feature that allows you to select from one of three themes: Classic, Luxe, and Pastel. • The program has extensive built-in help. One of my players told me that he didn’t know the rules for Hearts when he first downloaded the game, but that he quickly figured it out after reading the help files. • Every attempt has been made to utilize iPhone features to their fullest. The program saves its state between runs, so an incoming call or other distraction won’t ruin your game. The app works in both portrait and landscape modes. • Most card movements are animated. It helps you visualize who played what, and who won every trick. 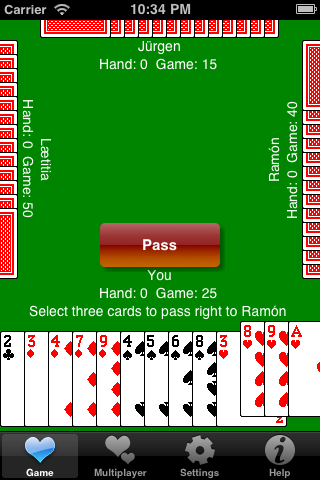 At the end of every hand, the program’s card view “rotates” around, revealing scores on the back. • Hearts rules enforced are exhaustive and complete. You can’t play point cards on the first trick. You can’t play hearts until after they have been broken. The game properly deals with “shoot the moon” scoring. • Very configurable. You can change the card play speed, the names of the players, and many other things. You can also make the game play all four hands and just watch if you want. The program keeps track of the total games played and how many you’ve won. I spent a whole lot of time writing the code for the robot players. I taught them everything I know about the game, and they use that knowledge to beat me pretty regularly. At the lowest skill level, the robots are terrible. They pick randomly from the set of cards that they can play legally on any given trick. 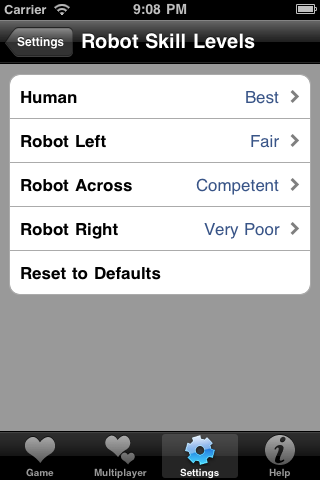 On the “fair” skill level, the robots gain the ability to pick decent cards most of the time. At the “competent” setting, the robots know about shoot-the-moon scoring. They will detect attempts by other players to shoot the moon, and will try to thwart them by taking at least one point. They will also mount their own shoot-the-moon attempts, if their cards are good enough. The robot players make shoot-the-moon attempts very infrequently, only about once every 200 hands. Even then, they only succeed about 11 times out of 20. At the highest skill level, the robots gain an ability I call “card counting.” Just as it sounds, the robot players have perfect memory of all tricks that have been played so far in the current hand. They can use this information to determine that some cards will definitely win a trick, or that other cards will definitely be taken by some other player. I should emphasize that the robot players never cheat! They will never peek at your cards or the hands of other robot players. Perfect short-term memory is a skill possessed by some humans, so I don’t think it is out of line to give that ability to my robot players. If you don’t agree, you can set the skill level down by one notch, and the robots won’t remember every previous trick anymore. Many of my players are good enough that they can regularly beat the robots. One of the things I’ve heard many times is that it’s too easy to shoot the moon. In the latest versions of the game, I’ve made the robots much more paranoid about watching other players attempting to take all point cards. I’m continually making adjustments to the robots based on user feedback, so if you have any observations, please feel free to email me. I’ll continue to improve the robots as time goes on. To date, Hearts Solo has been downloaded by more than 45,000 players. I’ve gotten a lot of feedback from people who have played it. Most requests are for scoring tweaks. Some people prefer a common rule variation where the jack of diamonds scores negative 10 or negative 13 points. Some people want a successful moon-shot to subtract 26 points from the winner, rather than adding 26 points to all the losers. A couple of people feel the game would be more challenging if current hand scores weren’t displayed. Some people want to be able to replay a hand. Some players want to stop a hand prematurely if there are no more point cards, or if they know they are going to win all remaining tricks. Eventually, I want to write a version of this program for the Mac. 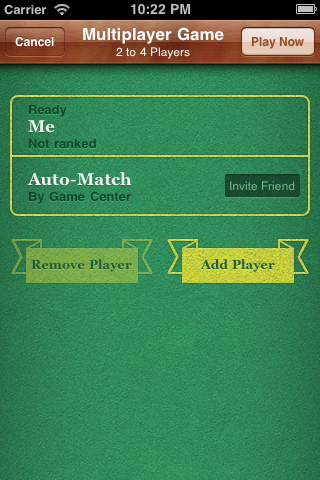 You will be able to play against friends in mixed games, some on Macs, some on iPhones. If this becomes popular and it’s worth my time, I’m not opposed to porting it to other phones or operating systems, depending on demand. You’re totally convinced that you want to try this now, right? Good. If you just want to kick the tires, get Hearts Solo. If you’re ready to buy, get Hearts Net. Finally, for old times’ sake, here’s a screen-shot gallery showing what Hearts Solo looked like when it was first released. 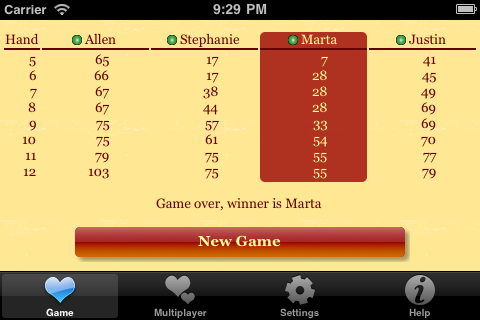 Clearly, my friend Steph did a good job of designing a better interface.